A Nigeria lady who committed suicide today, boxing day, left an heartbreaking note for her friends and family before taking her life. According to Twitter user @badman_niro who shared the story on his page, the young lady committed suicide today, which is boxing day. I just lost my girl to suicide now. How’s your Boxing Day going? 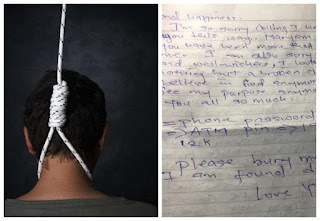 He also shared a snap of the suicide note she left behind. In the heartbreaking note, she said she was sorry for taking her life, before revealing that though she always looked happy, she was broken deep down.